South Korea's presidential office said Saturday that the country's president Moon Jae-in held a meeting with his North Korea's counterpart Kim Jong-un at the demilitarized zone. "The two leaders exchanged their opinions candidly to implement the April 27 Panmunjom Declaration and to have a successful North Korea-U.S. summit… Moon will announce the result of today's meeting at 10 a.m. [01:00 GMT] Sunday" Moon's spokesman Yoon Young-chan was quoted as saying by the Yonhap news agency. According to the presidential office, the two leaders met to discuss Kim's possible meeting with US President Donald Trump. The meeting was held amid an uncertainty from the part of the US president on the possible summit with Kim Jong-un. Earlier this week, Trump said that he was calling the much-anticipated meeting off, citing "tremendous anger and open hostility." 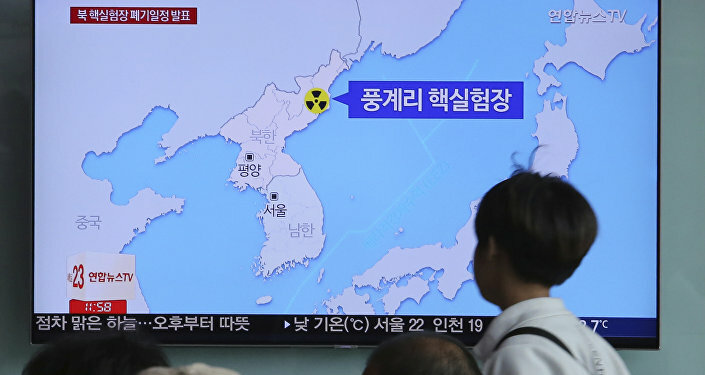 However, the US president said later that conversations were underway with North Korea and a canceled summit with Kim Jong-un could go ahead on "the 12th," an apparent reference to June 12, the previously scheduled date of the meeting. In April, North Korea's Kim Jong-un and South Korea's Moon Jae-in held a historic summit in the "truce village" of Panmunjom. The two officials signed a joint declaration, agreeing to take measures to support international efforts aimed at denuclearization of the Korean Peninsula and proceed with reunion programs for the separated Korean families. Following the meeting, US President Donald Trump said that he would hold a summit with the North Korean leader in "the coming weeks."